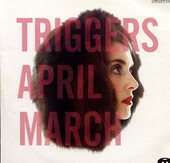 Elinore Blake's (aka April March) latest record, Triggers, was recorded while she was pregnant. The result finds Blake exploring herself and her love for music, resulting in a much more confident, free-flowing, and less controlled sound. Triggers outshines all other releases, if only for the fact the songwriting is able to breath and let loose, unbound by any rules or forced writing techniques. Still the French-laden, delicate pop of past releases, however, this time around Blake's rock 'n' roll side also gets to breath, the layered pop compositions exhibiting more signs of a rock 'n' roll pulse without giving up the lush, majestic pop. A real treat for April March fans, or fans of beautiful, uncompromising, timeless French-laden pop. I'll give it an A.
Appleseed Cast, The: Two Conversations Aquabats!, The: Charge! !